The global HoReCa drip coffee maker market is highly fragmented in nature. Strong presence of several players and low entry barriers are expected to make the competition highly intense in the forthcoming years. The declining growth rate of the global market is forcing companies to launch innovative products with impactful marketing strategies. Some of the key players operating in the global HoReCa drip coffee market are JURA Elektroapparate AG, Bunn-o-matic Corp, and Crem International AB. According to the research report, the global HoReCa drip coffee maker market is expected to be worth US$352.7 mn by the end of 2025. During the forecast period of 2017 and 2025, the global market is expected to exhibit a CAGR of -0.4%. 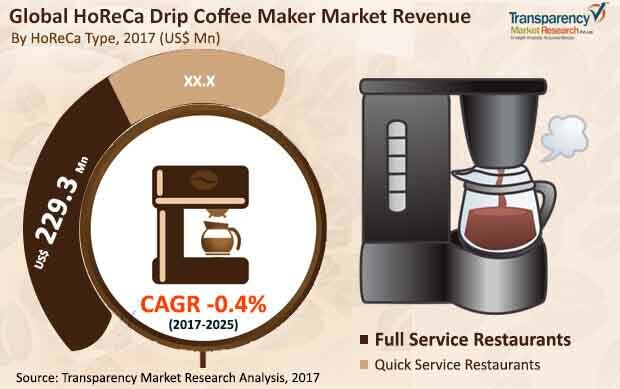 Regionally, the Middle East and Africa and Asia Pacific are expected show slightly positive progress in the global HoReCa drip coffee maker market during the forecast period. In terms of HoReCa type, the market is segment is into full service restaurants and quick service restaurants. Both these segments are expected to decline during the forecast period. Drip Coffee Maker brews coffee by percolating hot water through a brew basket of coffee grounds. Coffee is captured in a decanter that may be heated by a warming plate. HoReCa drip coffee makers are being manufactured by the various large scale companies with plants, where they are packaged and supplied globally. The majority of European based manufacturers are supplying the products globally. Growing urbanization and development in the foodservice industry, the expansion of a number of MNC outlets/ local coffee chains are driving the market. Innovative coffee shops and tea houses are bringing late-night café culture to several countries globally. It has become a part of culture with the rising population of millennials being provided with essentials in the cafés such as wireless connectivity and serene and peaceful environment and also space to socialize. The allure of drinking a cup of coffee has become a part of everyday lifestyle or in some cases an addiction – of today’s growing number of millennial population. For youngsters, coffee shops have become a place to socialize which provides a clean, peaceful and serene environment. Coffee shops have become a part of coffee culture. Some of the restraints that are potentially restricting the growth of HoReCa drip coffee maker market is the advent of new technologies and the consumer shift towards pod coffee and capsule coffee, which are some of the key roadblocks that have plagued the industry’s development over the years. Continuous innovations are taking place with introduction of state-of the-art technology driven coffee machines in the market. A single machine can brew different types of coffee nowadays and with superior quality and tasteful experience. Also at the coffee outlet’s end, the owners prefer to go for semi-automatic or fully automatic machines due to the ease of operations, lesser brewing time, and the wide variety of range which is available for the consumers as per their growing and changing demands globally. Furthermore, another prospective restraint of the HoReCa drip coffee maker market is the young population driving the market more for espresso coffee. This review is based on Transparency Market Research’s report, titled “Title: HoReCa Drip Coffee Maker Market (HoReCa Type – Quick Service Restaurants (Fast Food Restaurants, Cafeterias, and Carryout Restaurants) and Full Service Restaurants (Fine Dining Restaurants, Casual Dining Restaurants, and Hotel and Club Foodservice); Price Point – Less than US$100, US$100-200, and More than US$200) – Global Industry Analysis and Opportunity Assessment, 2017-2025”.